As someone who sells websites, knowing what people are looking for and how they seek it on the internet, is pretty important to me. Search terms are particularly important and I’ll always look to use the terms people search for, on my site. Imagine then my horror yesterday, when I used Google Trends on the term ‘Web Design’ and am confronted by the graph below. If you haven’t used Google Trends before, you should. It is the answer to everything that you have ever wondered. A glimpse into human psychology, politics, probability and behaviour. It is untainted data, without prejudice, bias or someone else incorrectly deciding what it means for you. And it can give you huge insights into any business that you are in. The problem is interpreting the data correctly, and that is an art form in itself. What do 'flags' tell us? Consider the graph below. It is of the word ‘flags’ in the UK. What do you think this graph tells us about the British, and how do you know you are correct? There is no right or wrong. But my interpretation of this graph is that it shows how absolutely crazy the English are about football. There is a spike every 2 years in June. 2004, 2006 (nothing in 2008, I’ll come back to that), 2010, 2012, 2014, 2016. So how do I know it isn’t the Olympics, or rugby, or anything else? Well the clue is the timings. You get the spike every time a European Championships is on or a World Cup. And the killer clue is 2008. Why weren’t people looking for flags in 2008? The European Championships was on. If it is football related and Euro 2008 was on, why not the flags? In fact, it is this reason we know it isn’t the Olympics, because they were also on in Beijing in 2008 at the same time. The curious thing about 2008 is that England didn’t qualify for Euro 2008! And so nobody googled for flags. They didn’t want to buy flags for their houses, flags for their cars, flags for their bedrooms, flags for pub decorations etc, because they couldn’t support their team as they weren’t there. If you were a British flag manufacturer, knowing this behaviour and how dependant you are on the England Football team’s performance, you’d gear your production around that knowledge and should they not qualify for the World Cup in 2018, you know not to make a bunch of flags you won’t sell. There are also some interesting cultural differences between nations. Consider the search term ‘fireworks’. Looking at the UK, you see a huge spike for November the 5th (Bonfire night) followed by a smaller spike on New Year’s Eve. You’d expect this. Nov 5th is firework night, but the British do like them on New Year’s too. In the US, the spikes are for New Year’s and also the 4th of July. In fact, the Americans really put all the emphasis on 4th July, New Year’s is not really that important in terms of fireworks. In Australia, you can see they view things the other way around to the Americans. Their big firework night is New Year’s Eve, and their Independence Day on 26th of January is a much less firework orientated affair. Finally consider the Spanish. If you have ever been to Spain, you’ll be aware that they chuck fireworks around the streets all year long, every single night and that there is not ever a time when you shouldn’t be buying and using them. Their graph shows a high background of firework searches with peaks only on New Year. So as before, if you were an international firework distributer, this would all be interesting information to know. So what has happened to 'web design'? And so I come back to ‘web design’ and the graph at the top of the page. There has been a huge decline in the number of searches for the term ‘web design’ in the United Kingdom over the last 12 years that I can view. I can see there is and has always been, a seasonal lull over the Christmas holiday period which I know to be true from past experience. 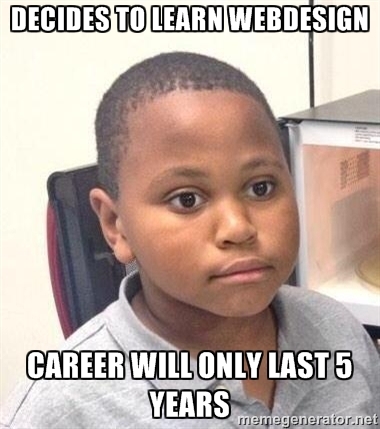 But why the collapse in people looking for web designers? My first guess was that maybe the job was now split and people looked for front end developers, graphic designers, SEO specialist etc? If that was the case, I could hit more key words and improve search traffic to my site. Alas, my first guess seems to be incorrect. My next guess was that maybe people are moving more towards mobile apps etc. But this doesn’t ring true either. I know more websites are built today than ever before in history. So where are my customers going and what are they googling to get there? Maybe small businesses are just using Facebook pages instead or other social media platforms? But then why is a website still so core to all your SEO planning? This is really important to me, and yet there seem to be few clues. And then it hit me. People are asking for templates by name. The changeover is stark and as a business I have to recognise this. Consumers are savvy enough to have heard of WordPress and search for it. But it also suggests that there is a huge amount of DIY web building going on these days. One of the largest changes in the business has been how accessible the internet is becoming to ordinary people. How easy it is to build a simple website with no knowledge of how to code, using a builder instead. Yes, if a business needs a complicated e-commerce shop or distributes digital content, people will hunt for a professional … at the moment. But small businesses such as plumbers, fitness trainers, caterers and consultants are increasingly looking to build a quick and easy web presence. I’m also starting to see these kinds of trends in the mobile app market. Off the shelf app templates are currently very immature and don’t provide all the functionality one would readily like, but they are getting better. So if the writing seems to be on the wall, where do I go with my strategy? First, working for larger businesses is very lucrative. They’d rather just outsource building a website than have one of their own members of staff battling away with it for 2-4 weeks. The next is the high end bespoke websites, custom built for the specific requirements of a client. And finally is the inclusive package where SEO becomes a large part of the build, and both visibility and the marketing strategy, rather than just a web presence, take centre stage.